I completely agree with Ebi – I think the pattern placement is very nice and subtle, in fact, and works well for the front of the top. I love the print and the pattern together, it’s beautiful! Thank you! I just got hung up on the print placement, but it doesn’t seem nearly as bad in the photos as it did in my head! It’ll totally get worn all the time anyways. The top looks fab. I think the dead space at the front looks great, the less busy design allows the flowers that are there to be visible. I love the tail. I’ll admit to hating facings but I like your idea of top-stitching them down. They just get so squirrely! Great top, this is exactly the kind of thing I want to be wearing during summer. Yes! Top stitching them down is a great way to go. That or use an all-in-one facing that connects to the armholes… they’re really not so bad! And yes, I love this shape for summer also… breezy and not at all constraining! I really like it! And your shorts are perfect for summer. Comfy and cool! Thank you! Glad I went with such a simple shape—it’s perfectly breezy for dealing with the heat. And nothing says summer like a good pair of linen shorts! Cute top! I know it’s simple, but I love the fit on your shoulder and upper back in particular – the way it hangs there is so flattering. The pattern placement looks good to me – the floral is so busy that I don’t think I would have noticed the “dead space” if you hadn’t mentioned it. And even noticing it, it looks good. I think the back yoke is what gives it such a nice shape—it really makes a difference! And I’m glad the print placement isn’t as bad as I had first thought. Thank you! Nice top! Love those flowers. I’m fond of facings myself. I like the finished look and the bit of structure they give. Beside under stitching, I sometimes just stitch in the ditch at shoulder seams. Yay! Someone else who is pro-facing! I also stitch them down at the shoulder and/or side seams when I don’t want any top stitching; it’s an easy way to keep them in check. Thank you! Thank you! For $5/yd I couldn’t pass it up! Love your top! The first adjustment I always have to make is the narrow shoulder adjustment, it’s an easy one to do and makes a huge difference. Thank you! When you narrow the shoulders, do you just shave off the outer edge or do you slide the whole shoulder over? Most of the information I’ve found has you do the former… I suppose it depends on the pattern? I love your top, it is just the right one for hot weather. The print placement is alright! Nice shorts, too. So pretty! I kinda love facings too. They give such a nice clean finish and are easier and faster to put in than bias binding. What a great summer top! I can’t believe you got this fabric at JoAnn’s. I don’t have one easily accessible to me so really don’t know what they’ve been carrying these days, but it’s great to hear that the selection seems to be improving while keeping the low prices. 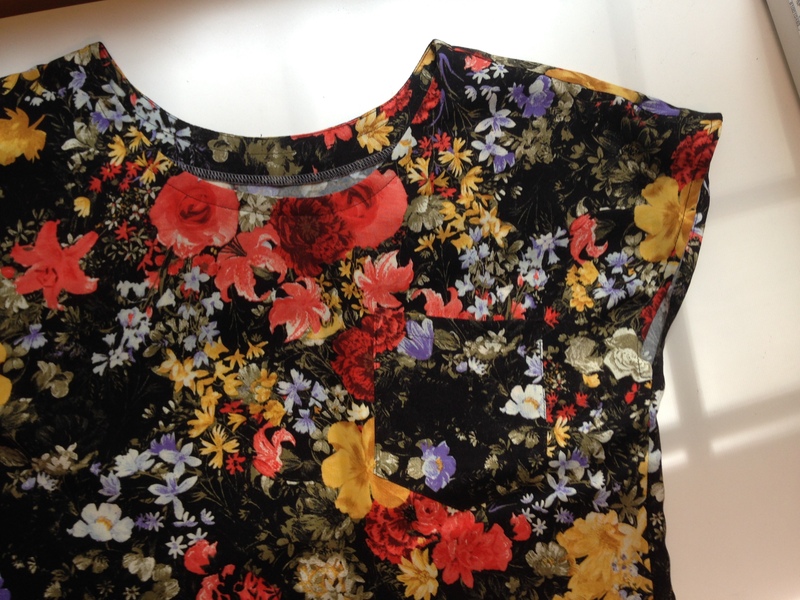 And I agree with the others about the print placement on the front – I love the flowers right at the neckline! I liked your shirt so much I looked at the pattern, but view D has a cut-out in the back. What made you decide to skip the cut-out and did you just use a ruler and connect the line to fill it in? Thank you! I was afraid the cutout would dip past my bra in the back, so I filled it in by extending the CB seam up, then drawing in the upper edge on my pattern piece. I believe I curved it slightly, but not much. Sorry, I know that isn’t all that scientific! So pretty. You know I really like facings! I’m probably in the minority but I’d much rather a facing than faffing with bias tape! Love this outfit. 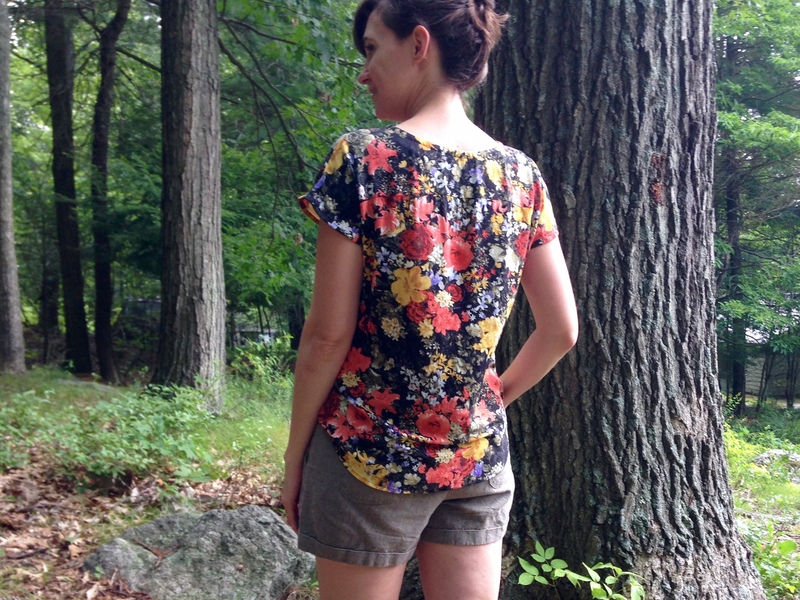 The floral top pairs beautifully with your linen shorts. Pretty! I love the floral on black. And I have found some seriously awesome fabrics at Joann’s lately, too! I think they have stepped up their game. This top looks great! 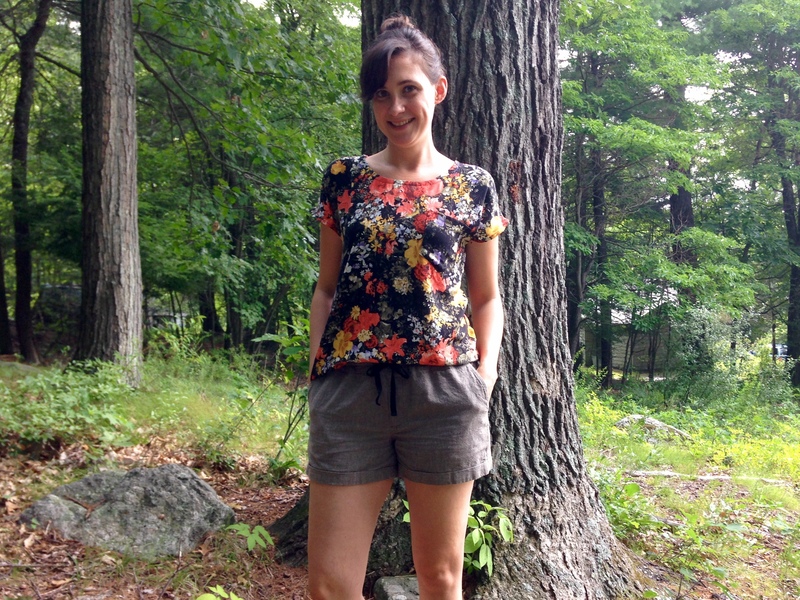 That floral is so pretty and I’m totally digging your linen shorts too! Lovely, and your adjustments look spot on. This is so pretty! And I share your love for kimono tops! 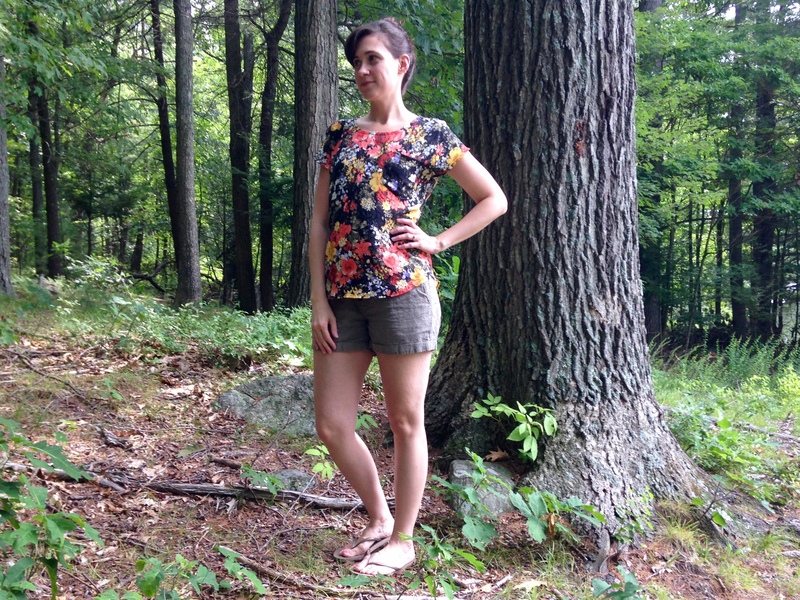 I just made three using Simplicity 1690… I realized after a ruthless wardrobe cull that I had exactly two woven tank tops and two woven tees left; my only other tops were grungy tees! Whoops! Got too carried away! But I should try this pattern because I prefer facings as well. They just feel more finished, plus sometimes I feel like it’s hard to sew bias tape on really nicely. You are finding some great fabrics at Joann! 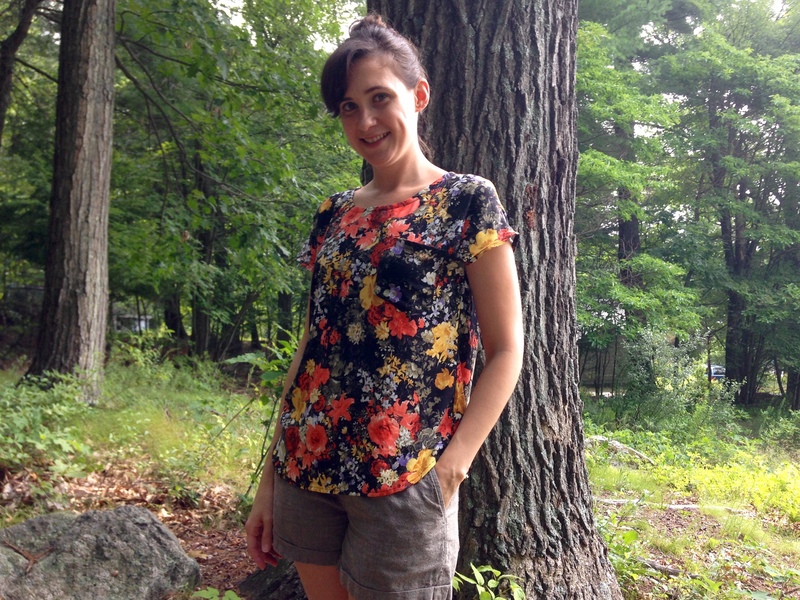 I also made this top in rayon challis (my new favorite fabric) but with the cutout. It works fine on me with a bra fyi. Great work as always!